Despite the inevitable fuss over the show gardens, the highlight of my visit to Chelsea Flower Show is always the Great Pavilion. At 12,000 square metres, about the same size as two football pitches, it dominates the show ground. It’s here that many of the greatest nurserymen and horticultural organisations showcase their latest discoveries and cutting-edge projects; and they are not just from the UK, but as far afield as Japan, Grenada, Thailand and South Africa. The standards are always incredibly high with 54 exhibits, more than half of those housed under the Pavilion’s taught tarpaulin, awarded gold medals this year. The stand-out result had to be that achieved by Hilliers, celebrating their 150th year in the nursery business. The family firm was awarded its 69th consecutive gold medal for its stunning display of trees, flowering shrubs and perennials around the central monument. Congratulations to them on their record-breaking achievement. The Hilliers exhibit features around 4,000 plants, so choosing just 10 from the show to feature in this post is a challenge. 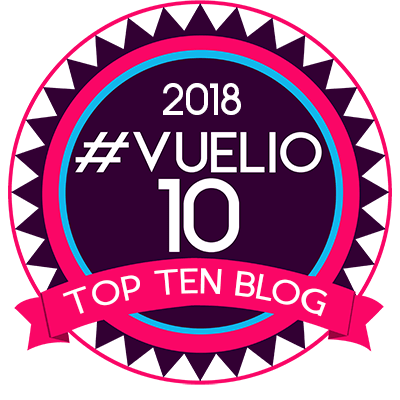 My selection this year is a little eclectic and reflects what caught my eye on the day rather than what’s new. 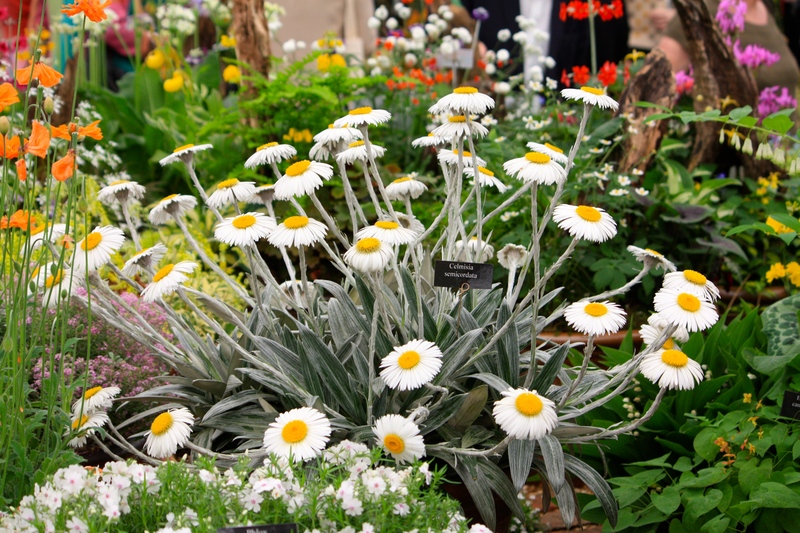 So many of the plants launched at the show have that ‘trying too hard’ look about them, so I tend to steer well clear. There was a definite fashion for dark coloured flowers, not all of them attractive, and foxgloves abounded to the point of excess. None of them made into my list. I love a good hosta; grown well there’s no foliage plant to rival its beauty and variety. Brookfields’ gold medal winning display caught my eye this year, brimming over with beasts as large as H. ‘Sum and Substance’ and H. ‘Empress Wu’ and as diminutive as H. ‘Cracker Crumbs’. A new introduction called H. ‘Firn Line’ was my favourite. 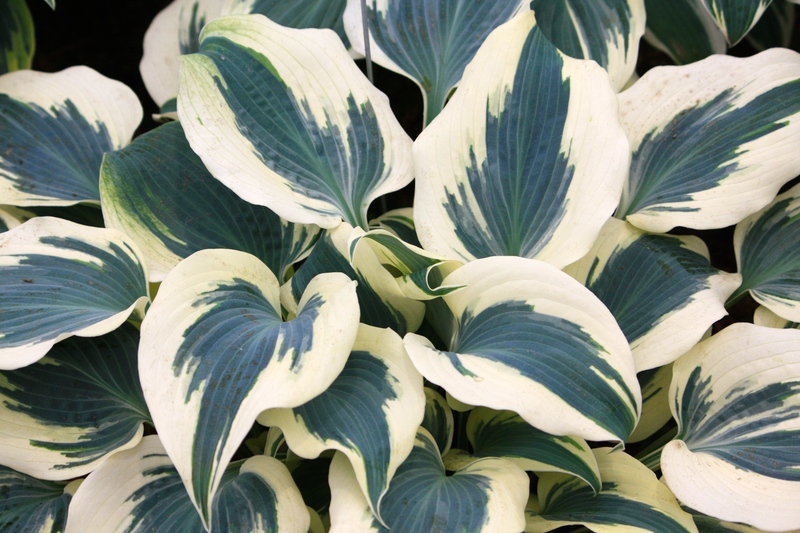 Its striking heart-shaped foliage is blue-tinted with a broad cream margin which fades to white during the growing season. Lavender blooms (alas unscented) appear in midsummer, but are simply gilding the plantain lily. Staying with the foliage theme for the moment, no-one could pass by the luminous lily of the valley, Convallaria majalis ‘Verwood Golden Slippers’ without lingering to admire its vitality. From Avon Bulbs, this is a plant that requires some patience to get going, but will reward you with startling golden leaves in early spring. Who would not wait with baited breath to see this emerge from the soil each year? My Australian friend and I were both agreed that Britain’s rose breeders need a kick up the backside when it comes to staging their exhibits, which look increasingly old fashioned and uninspiring. Even David Austin Roses, which have done so much to move the industry forward, have not done anything exciting at Chelsea for years. Most of the new rose introductions were not worthy of my list, if indeed one could identify them at all. 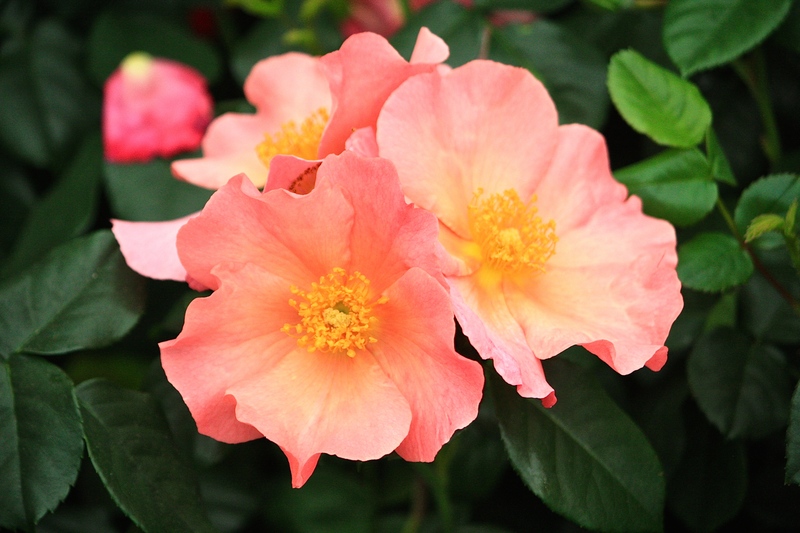 However Rosa ‘Simple Peach’ from Harkness Roses was undeniably pretty. The single flowers are attractive to bees, making it a great choice for anyone looking to encourage wildlife into their garden. It’s generally considered something of a faux pas to make spelling errors on plant labels at Chelsea and this one did not go undetected. Not only was this lovely Zantedetia (sic) misspelt, but the variety, ‘Queen of Dominica’ also appears not to exist, in the UK at least. Despite its uncertain identity, I felt this lovely flamingo-coloured flower deserved a mention. 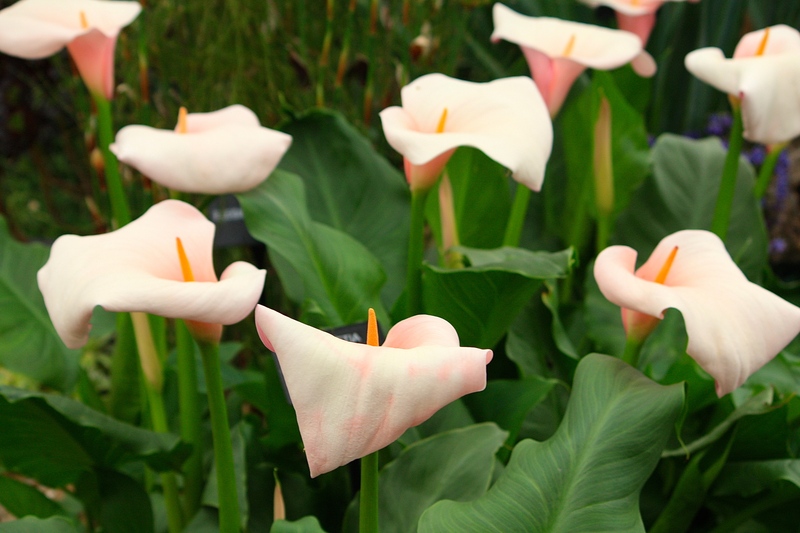 If you are as taken by it as I am, Zantedeschia aethiopica ‘Marshmallow’ has a similar stature and colouring. Before I move away from the coral theme, two plants shown by Claire and Jeff at Trewidden Nursery in Cornwall. Their meticulous display of hardy (ish) exotics earned them a well deserved gold medal, a brilliant achievement after the trials and tribulations of the wild winter they experienced in the South West. The first is Leucospermum glabrum x tottum ‘Volkano’, a spring flowering South African shrub which is best suited to coastal gardens, where it requires very little water or routine maintenance. 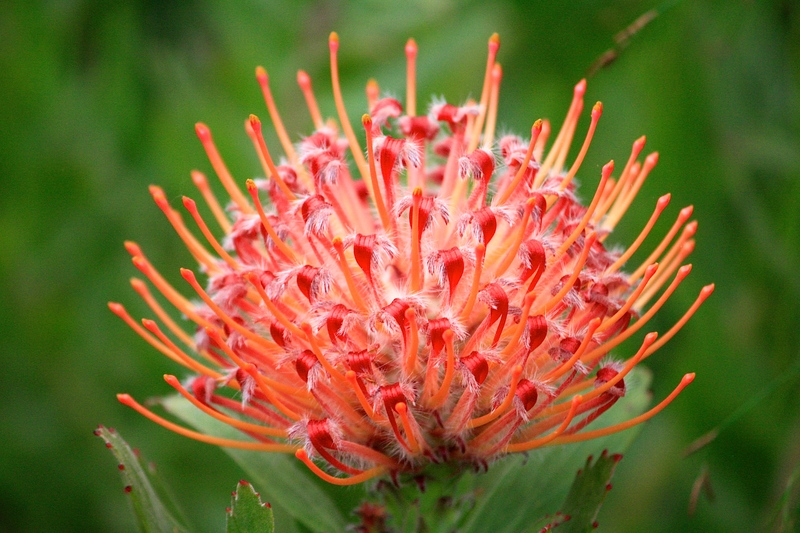 The flower heads are nothing short of spectacular and earn it the common name ‘pincushion protea’. 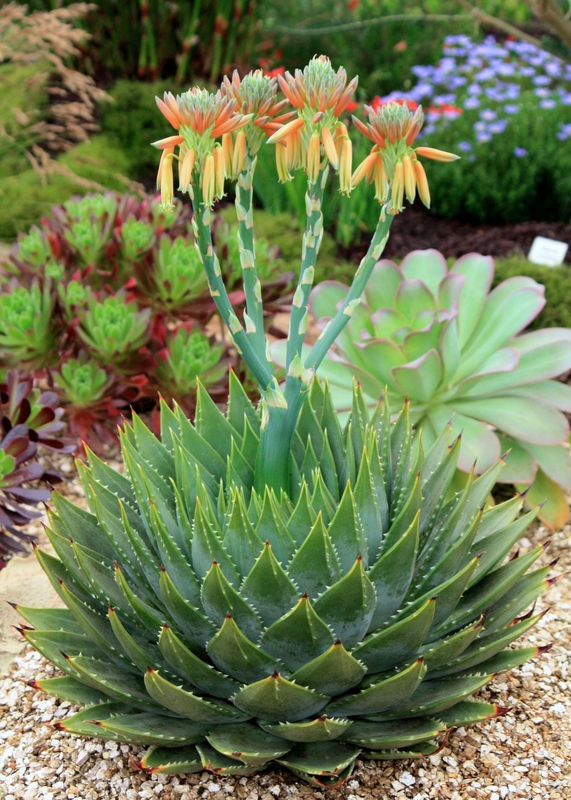 Taking centre stage amongst a superb array of succulents was Aloe polyphylla, the spiral aloe, so called because of the way its leaves spiral out from the centre of the plant. Aloe polyphylla is endemic to the Kingdom of Lesotho in the Drakensberg mountains where it grows on high slopes and in rocky crevices. Summers here are cool, and in winter the plants might even be covered by snow. It is considered particularly tricky to grow, so hats off to Trewidden for coaxing this magnificent specimen into flower right on cue for Chelsea. 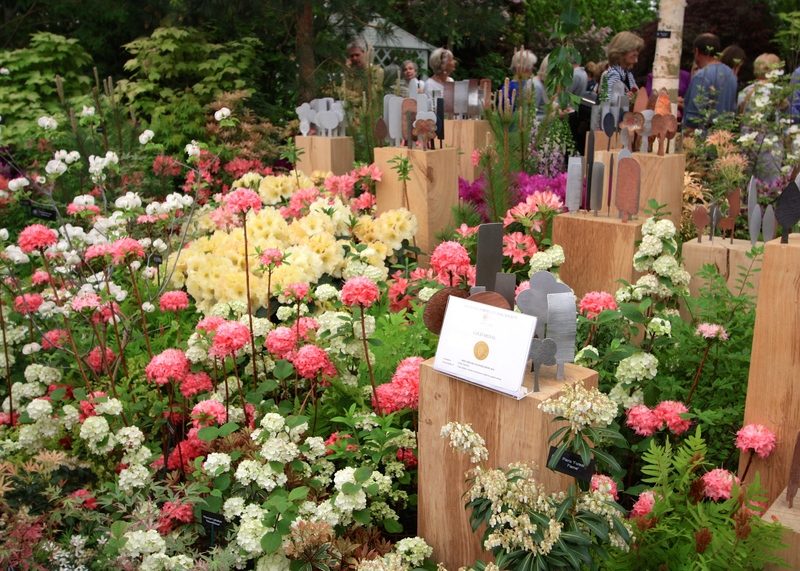 One of my favourite exhibits at Chelsea is staged by Kevock Garden Plants from Midlothian, Scotland. This year’s island site provided new opportunities and as always the array of rare and interesting alpines was second to none. The stand-out plant for me, occupying centre stage, was a magnificent Celmsia semicordata, a plant hailing from New Zealand’s South Island. Here the Maoris used to peel the silvery underside from the leaves and attach it in rows to create a rain cape. The leaves were also packed into leggings and shin protectors for warmth and to guard against thorny plants. A plant as useful as it is beautiful. Staying with Kevock for another of my top ten, this divine saxifrage, producing delicate veils of pure white flowers, is Saxifraga ‘Brynhyfryd Hybrid’. It was shown alongside another hybrid cultivated by Matthew Ruane at Brynhyfryd Nursery called S. ‘Nicholas’. Two wonderful plants for an alpine garden and just crying out to be admired. My big discovery at this year’s Chelsea was Tale Valley Nursery, a small specialist nursery in Devon offering a range of alpines, bulbs, herbaceous woodland plants and ferns. I was bowled over by the variety and quality of the display, which rightfully won proprietors Chris and Lorraine Birchall a gold medal. I noted down treasures such as Beesia calthifolia, Disporopsis ‘Min Shan’, Carex siderosticha ‘Shima-Nishiki’, Vancouveria hexandra, Coptis omiensis ….. I could go on but any more dribble on the laptop keyboard and it might fuse. 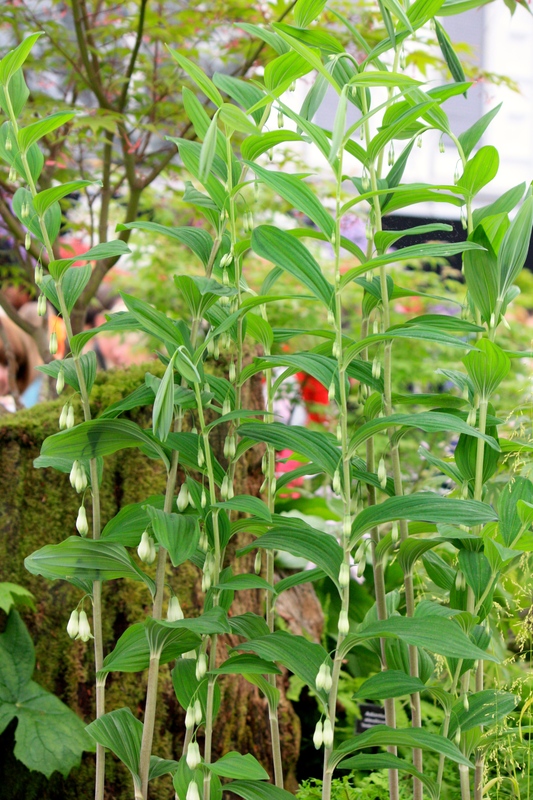 I had to choose just one plant to feature in my top ten and that is Polygonatum stenanthum, a towering giant of a polgonatum that can grow up to 2m tall. Absolutely wonderful and a nursery I have a feeling I will be patronising in future. 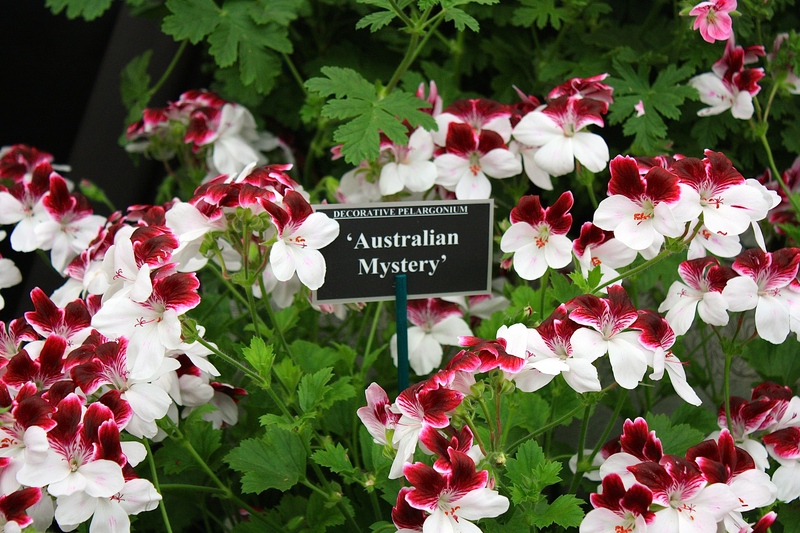 Finally, and in honour of my fabulous friend and flower show companion ‘Helen of Oz’, a pelargonium named ‘Australian Mystery’. Unlike some other pelargoniums the flowers are simple and nicely spaced apart, the top petals stained and feathered berry red and the lower petals pure white. Shown by Fibrex Nurseries, this would make a super infill plant for borders after early bulbs and perennials have died down, or planted to cascade out of a pot or urn. I hope you’ve enjoyed my somewhat random but considered selection from Chelsea’s finest. Do let me know which is your favourite or if, indeed, any turn you off completely. Love the Mystery Zantedeschia and the Pelargonium ‘Australian Mystery’ and could do without the Aloe polyphylla. 🙂 Great plants and photos. Thanks for sharing. Thanks for showing us these lovely plants. The Hosta and Polygonatum are really eye- catching and the Zantedeschia is lovely too. I bought a Beesia calthifolia from Crug Nursery a couple of weeks ago and it is gorgeous. From Helen of Oz – now back in Oz… have really enjoyed all the Chelsea Report postings, thank you – what a fabulous experience to be part of this wonderful show….. I have been enjoying your show posts as I know I will never get there in this lifetime! One thing though on this post…just a little correction of a plant name. 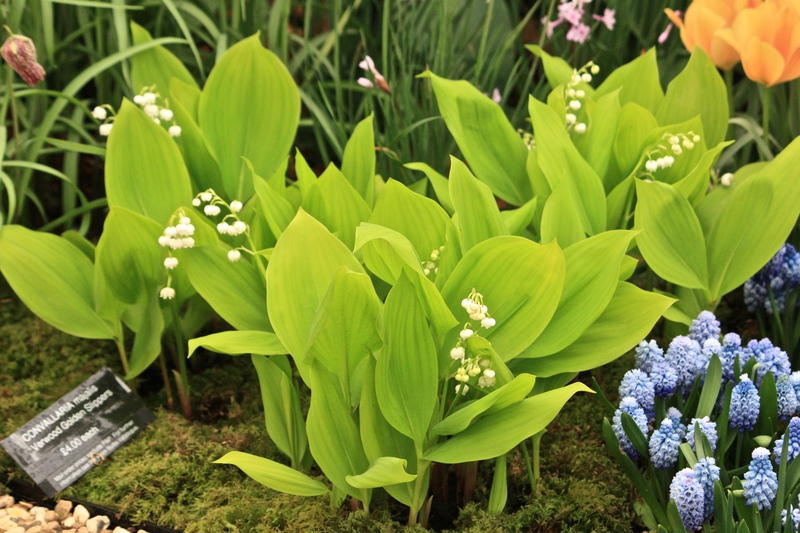 The Convallaria is actually called ‘Fernwood’s Golden Slippers’. It was discovered at http://www.fernwoodnursery.com/ on the Maine coast by the owner. Here’s a link to Plant Delight’s Nursery who lists it for sale…http://www.plantdelights.com/Convallaria-majalis-Fernwoods-Golden-Slippers-for-sale/Buy-Lily-of-the-Valley/ I stopped at Fernwood a couple of years ago and picked up a few very choice and hard to come by plants! Thanks for that Amy. I took the name straight from the label on the stand but I can see you are right. A nice little provenance story there, fascinating. I am so pleased you are enjoying the show posts and hope I have been able to give you a flavour of my day there. One more post to come I think and then I must start catching up on other garden visits. May is all go! The Simple Peach roses are quite lovely. I have not seen those before. Thanks for sharing your photos from the flower show! 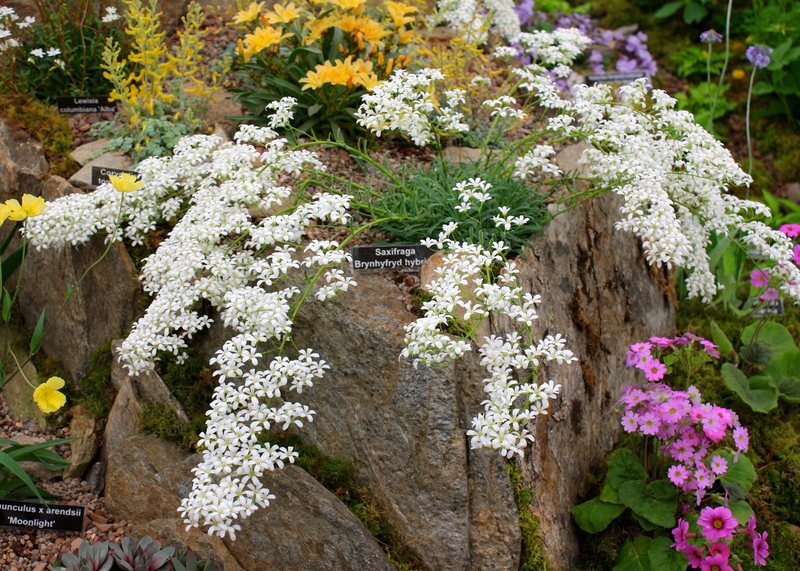 Just for the record, the Celmisia was exhibited by Harperley Hall Farm Nurseries.